Jigme Gyalwa Nyugu was born in 1765 into the Getse nomadic clan of the Dzachukha Valley, and was named Pema Kunzang. As a young child, his being was already filled with renunciation and a great yearning to go to a solitary place and devote himself to meditation. However, he was under great pressure to put aside this inclination and to take up responsibilities in the household. 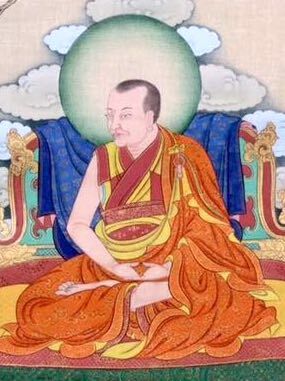 From the age of twelve he began to learn to read, and at fifteen received instructions on Dzogpa Chenpo from Getse Lama Rigdzin Gyamtso, the practice of which led him to experience numerous visions and premonitions. At the age of sixteen, he was forced to join his elder brother on business trips, during which the lying, cheating and cursing that he witnessed among traders only enhanced his great revulsion for samsara. When his brother died two years later, Gyalwa Nyugu became the eldest son, and the pressure from his family and clan for him to marry and lead a lay life increased all the more. However, with his brother’s death Gyalwa Nyugu resolved to dedicate his life to Dharma. Finding no other solution but to run away from home, he travelled to Central Tibet with a likeminded friend. Their long pilgrimage took them to Samye, where they met the first Dodrubchen. He advised them to seek out Jigme Lingpa at his hermitage, Tsering Jong. They left at once and upon coming into the presence of Jigme Lingpa, Jigme Gyalwa Nyugu’s being was filled with incredible joy. With true devotion filling their hearts, they received empowerments, transmissions and detailed instructions on Dzogchen. After two years in retreat, Gyalwa Nyugu returned to Jigme Lingpa and received many more transmissions and instructions, after which his Lama instructed him to meditate at the sacred mountain of Tsari. During his arduous journey to Tsari Gyalwa Nyugu gave his shoes away to a beggar, and so by the time he arrived his feet were badly injured. He spent nine months in strict retreat at Tsari, surviving on a minimal amount of food. Suffering extreme hardships, he was sustained by the remembrance of his root guru and, through his blessing, he realised the ultimate nature of mind. After this retreat, although barely able to walk due to malnourishment, he made the difficult return journey to Jigme Lingpa at Tsering Jong. After receiving his Lama’s blessings, Gyalwa Nyugu set off for another six months of retreat at Orgyen Ling hermitage. There he resolved even the most subtle points relating to his view and meditation, thus dissolving all subtle clinging to a meditator and a meditation. Gyalwa Nyugu then received a request from Dodrubchen to join him at Tsering Jong. In the presence of both Jigme Lingpa and Dodrubchen, Gyalwa Nyugu offered an account of his realisation which caused great joy to arise in their hearts. After having found a doctor who successfully cured Jigme Lingpa’s eye problems, Gyalwa Nyugu joined Dodrubchen on his trip back to Kham. Then, after several more retreats in Kham, he returned to Tsering Jong and experienced for the last time the great joy of seeing his Lama, Jigme Lingpa. Having bestowing profound instructions on Gyalwa Nyugu for two and a half months, Jigme Lingpa invited his disciple to remain at Tsering Jong for another three years. However, being bound by other obligations, Gyalwa Nyugu received some last advice from his master and then returned to Kham. Gyalwa Nyugu spent many years in retreat, mainly around Dzogchen Monastery and the Dzachukha Valley, and had many extraordinary experiences. In 1804 Gyalwa Nyugu made Trama Lung in Dzachukha his main residence, and spent the next twenty years living there with a group of hermits, practising and teaching in the local area. Gyalwa Nyugu and Dodrubchen were very close, sharing the same root Lama and both striving to uphold the Longchen Nyingthig lineage that they had received. In Kham, Gyalwa Nyugu often assisted Dodrubchen in his teaching activities and in the building of Dzagya Monastery in the Dzachukha Valley. This gompa would eventually become the seat of Gyalwa Nyugu and, later, that of Patrül Rinpoche. In 1814 he met Do Khyentse, the incarnation of his Lama, Jigme Lingpa, and offered him many teachings. Later he would also receive empowerments from Do Khyentse and would, through his heartfelt one pointed prayers, prolong Do Khyentse’s life. He devoted the entire latter part of his life to teaching, giving empowerments and instructions to all devoted and sincere students who requested them, such as Gyalse Shenpen Thaye and Patrül Rinpoche. It was during this time that he gave Patrül Rinpoche teachings on the Ngöndro of Longchen Nyingthig twenty-five times, as well as the teachings on tsalung and Dzogchen. He merged his mind into dharmakaya in the Water Hare year of 1843.